Home Reliable Everything We Experience Has Value! 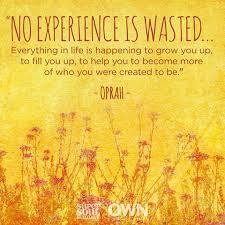 Time, any experience, a mistake, nor blunder is ever a waste of anything. Everything, and I mean everything, we have ‘gone through’, anything that has had an ‘impact’ on our life has been for a very specific cause. Those actions and events that life has offered us up to now, have been to move us in the right direction, the course that we must take in order to reach our authentic destination. Why must life treat me so harshly, we might ask ourselves? Why does all the bad stuff happen to me? What am I doing wrong? This is the question that has the most substance – what am I doing wrong!! If you are constantly suffering, day after day, with unhappiness, restlessness, mental fatigue, resentment, fear and perhaps anger, then you ARE doing something, not necessarily wrong, but something that isn’t serving your Soul or your Higher Good. You are trekking on a path that you are not meant to be on. Somehow, somewhere, you took blind turn and ended up in a incorrect direction. I can guarantee that there have been many ‘signs’ in the past, messages or synchronisities to bring awareness to you, all of them saying ‘look in another direction’, but you have been too afraid, stubborn or not ‘awake’ enough to pay attention. It is not to say, that when you turned right on your path and you should have gone left, that it was a mistake. There are no mistakes in life, just lessons to help us grow, and naturally develop. What occurs in our life that is unpleasant, is only to help steer us back on the path that we are suppose to be walking on. If you are feeling out of sorts, then perhaps there is something else you are organically suppose to be doing. Listen to the messages from your Sou and the Universe, to set your sails on the course of direction that is waiting for you. Let the wind blow your sails towards your true purpose, this is where you will find your ‘bliss’, and your ‘joy rising’. All it takes is courage, faith and patience. Take the leap into the unknown. With a deep breath, close your eyes and say ‘to heck with it’, I’m going to take a chance on my intuition. Your intuitive nature is far, far better stakes than the lottery.